Teachers, instructional leaders, and researchers work together to develop, refine, and share student-centered instructional approaches. 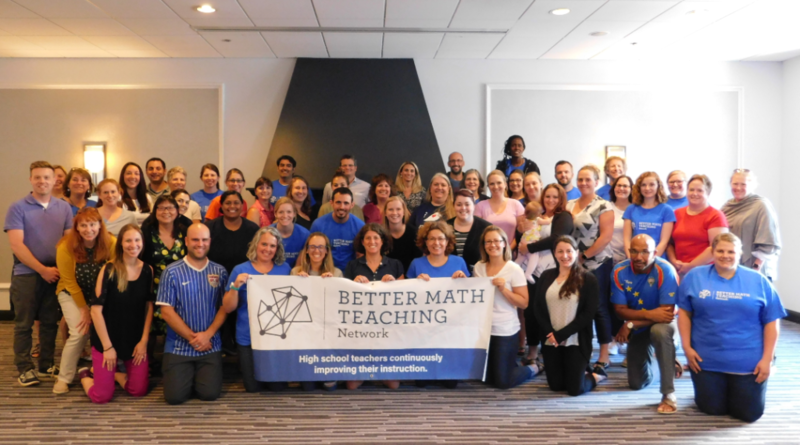 The Better Math Teaching Network is designed to better understand student-centered instruction in high school mathematics. The project involves the creation of a Networked Improvement Community (NIC), where researchers and educators work side-by-side to examine instruction through a continuous improvement model. The collaborative approach includes specifying a common problem related to student-centered math teaching, testing out potential ways to address the problem, sharing how it went with others in the NIC, and continuing with additional cycles of testing, sharing, and refinement. Participation in this project provides the opportunity to share and test ideas with other teachers in the New England area. Click play on the video for an overview of the Better Math Teaching Network. High school Algebra I (or the equivalent) teachers and instructional leaders from across New England are invited to participate. Because the project focuses on student-centered math teaching, we want teachers who are interested in focusing on some aspect of this type of instruction within a collaborative community of like-minded teachers. We are interested in state-, district-, and school-level instructional leaders who work in some capacity with high school Algebra I (or equivalent) teachers. The majority of the network’s activities will be integrated into teachers’ daily work. For example, if a group of teachers decides to implement a particular strategy for engaging students in problem solving, each teacher would implement the strategy within their class(es) and standard curriculum. There is a summer institute and four 1-1.5 day in-person meetings in the Boston area. For work that occurs outside the school day, the project will compensate teachers for their time, following applicable district policies. The project will also pay for all travel and lodging costs associated with in-person meetings. The leaders will serve as advisors to and supporters of the project. This work involves (1) hearing about the strategies BMTN teachers are testing and refining, and having teachers the leaders are working with test out the strategies in their classrooms; (2) sharing resources and strategies that BMTN teachers might use in their improvement projects, (3) providing insights into policies that might affect the instructional work of the network; and (4) helping recruit additional teachers and instructional leaders to the network. The leaders will participate in a one-day, in-person kickoff meeting in September 2018 in the Boston area, meet virtually every 6-8 weeks, and participate in a two-day culminating meeting in May 2019 with the BMTN teachers. Like the teachers, leaders will be compensated for time spent outside of working hours and all travel and lodging costs will be paid for by the project. The teacher summer institute will take place July 15-19, 2018 in Boston, MA. Attendance at the summer institute is required for participation in the network. The instructional leaders will have a separate kickoff meeting in late September. Teachers will meet in-person four times during the 2018-19 school year. The meetings will last one or two days and occur in October, December, March, and May on dates most convenient for teachers. Instructional leaders will meet in-person twice during the 2018-19 school year: a daylong kickoff meeting in September and a daylong meeting in May with the BMTN teachers. All in-person meetings for teachers and instructional leaders will take place in the Boston, MA area. The total estimated teacher time commitment for all network activities is 100 hours (July 2018-May 2019). This includes attendance at all in-person and remote meetings as well as full participation in all planning, data collection, and reflection activities associated with testing and refining student-centered instructional strategies during the school year. Teachers will receive a stipend of $5,000 for the 100 hours of participation, paid in three installments. All travel and food expenses for in-person meetings and the summer workshop will also be covered by the project. The total estimated instructional leader time commitment will vary depending on the number of activities each leader participates in. Stipends for the in-person meetings will be $500 each, or $1,000 total.